On May 1, 1212 a damaging earthquake took place in south Palestine that also affected Egypt, where it was strongly felt in Cairo and Fustat and destroyed a number of houses. At al-Shaubak and al-Karak near the Dead Sea, towers and houses were destroyed, killing a number of women and children. 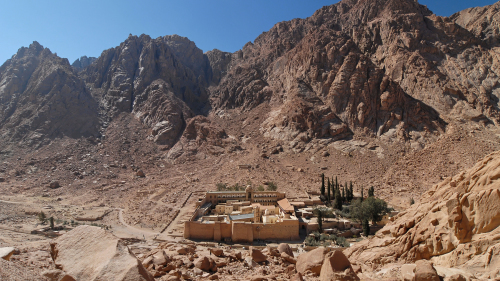 In the Sinai Peninsula, the shock caused severe damage to the Monastery of Saint Katherine, destroying a major part of its fortifications and damaging the church. The northern wall of the monastery, with its northwest and northeast corners, collapsed. Of the cells, some were destroyed completely and others lost their roofs, apparently without loss of life. This was possibly due to the fact that the earthquake, which struck at dawn, was preceded by a foreshock at sunset the previous evening (Monday 30 April), which might have served as a warning. The shock triggered rockfalls from the mountains behind the monastery, and was followed by aftershocks that continued for a year. According to manuscripts from Saint Katherine's at Sinai, the date of the earthquake was annually commemorated as a day for prayers and penitence. According to Archbishop Nektarios of Sinai in 1658, the walls and cells were almost immediately rebuilt with the assistance of Metropolitan Gabriel of Supaki (Petra), whose caravan of builders originally sent to rebuild the church at Agia Koryphi or the Holy Peak (Jabal Musa), damaged by a previous shock, arrived at Saint Katherine's six days after the earthquake.